Former MP George Galloway has announced he will stand for Mayor of London in 2016, having lost his parliamentary seat in the general election. The Respect Party leader told the press in April he would run for London Mayor if he lost his seat in Parliament. Speaking to LBC Radio on Thursday, Galloway said he hoped to emulate Greece’s anti-austerity party Syriza in the mayoral election. “The people in London who feel that they are forgotten by the mainstream political class will find a voice in me,” he added. While Galloway declined to elaborate on the details of his manifesto, he said housing was the most important issue in London at the moment. “Housing is the major issue. The fact that no public housing is built, [and] that the Cameron government is committed to housing association homes being sold off, and of course we all know they won’t be replaced by social housing. “The obscene spectacle of millionaires, even billionaires, buying up London properties and using them as cash boxes, driving working people out of London,” he added. “There have only been two London mayors, both of them have been colorful and both have projected themselves as independent-minded people,” he added. Boris Johnson MP will be standing down as Mayor of London next year after serving two four-year terms. Johnson, who is known for his eccentric public persona, won a seat in Parliament for Uxbridge and South Ruislip in the general election. Several prominent figures have already announced their intention to run for mayor. From the Labour Party, former Shadow Education Minister Diane Abbot, former Culture Minister Tessa Jowell, former Transport Minister Sadiq Khan and David Lammy, the former innovation, universities and skills minister, have all said they will bid for the position. From the Conservative Party, businessman Stephen Greenhalgh, gay rights campaigner Ivan Massow and former England footballer Sol Campbell have all said they will stand in the election. 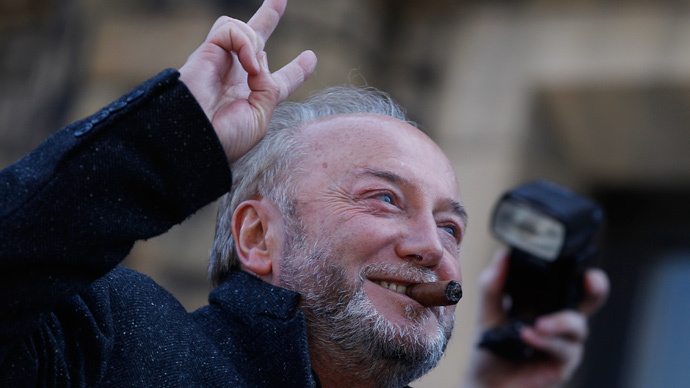 Galloway’s announcement comes after losing his Bradford West seat to Labour candidate Naz Shah by a majority of more than 11,000 votes. The ex-MP has since launched a legal challenge against the result, claiming to have evidence of “malpractice” in postal voting. He also claims the results were affected by “false statements” made by Shah. Galloway accused the Labour candidate of lying about being forced to marry her cousin in Pakistan when she was 15.